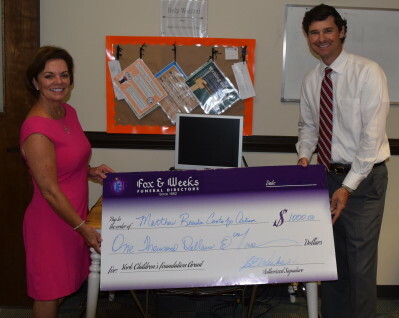 Fox & Weeks Funeral Directors was privilege to presented a Matthews Children’s Foundation grant in the amount of $1000 to The Matthew Reardon Center for Autism in June. Fox & Weeks has now awarded more than $25,000 in Matthews Children’s Foundation grants since 2012. Each time a family purchases a casket at Fox & Weeks, a portion of the cost is donated to the Matthews Children’s Foundation in the name of the deceased and the accumulated funds are distributed quarterly through an application process to area non-profits benefiting children and children’s causes. The Matthew Reardon Center for Autism is dedicated to the care and education of children with Autism Spectrum Disorders, and the grant money will be used to purchase “build it yourself” computers and other STEM materials for the unique needs of Reardon Center’s students. Through free advocacy services, the advanced academy, and community outreach the Matthew Reardon Center provides support that enhance the quality of life for children on the autism spectrum and their families. The Matthews Children’s Foundation is affiliated with the Matthews International Corporation casket division and has delivered millions of dollars in grants throughout the country since its introduction in the early 1990s. Fox & Weeks is the only funeral home in the Savannah area actively participating in the Matthews Children’s Foundation program. The purpose of the Matthews Children’s Foundation is to support non-profit organizations dedicated to children, and any organization in the Coastal Empire with the primary purpose of providing for children’s needs is eligible to apply for a Matthews Children’s Foundation grant. To qualify for a Matthews Children’s Foundation grant through Fox & Weeks, an application must be submitted and an organization’s activities must be primarily directed towards the welfare and benefit of children. Please call Fox & Weeks at 352-7200 for more information or visit www.foxandweeks.com and click on the Resources page to learn more about the Matthews Children’s Foundation application process.